Search has changed. Search marketing now works differently. Semantic search is disrupting many of the practices associated with traditional search engine optimization techniques. David Amerland takes the complex subject of semantic search optimization and reduces it into twenty manageable steps anyone can apply. Start using semantic search techniques from the very first moment. Designed for the busy webmaster, business leader and entrepreneur, each chapter can be read alone, or in sequence. A comprehensive list of 200 questions, presented at the end of each chapter in tranches of ten allows you to reshape the entire way you approach digital marketing and search, irrespective of the size of your business or the budget available. Immensely practical, easy to read with each chapter standing alone this is the down to Earth aid to semantic search that you have been looking for. Now, backed up by an online community and an online progress form it helps readers with a structured, support network for accelerated learning, sharing of best practices and direct access to me. 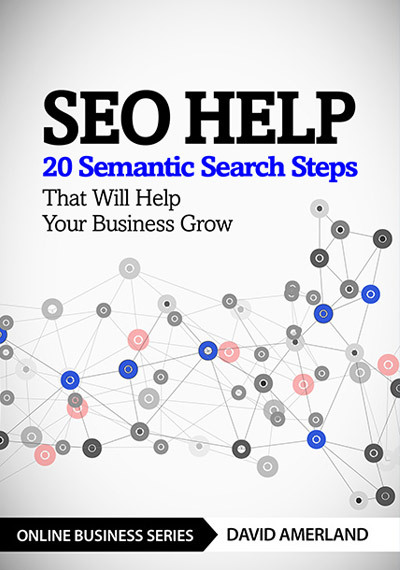 Get free PDF sample of SEO Help. Click here to load on your browser and then save as a download.